Sound Foundations Books reading and spelling programmes: easy-to-use books developed to teach reading and spelling to young children and students struggling with literacy. Our books are designed to empower amateur teachers (AKA parents) and make life easier for busy professionals. We’ve built in all the lesson planning and monitoring—so you don’t have to do that. No training courses or extra resources—everything you need is included. 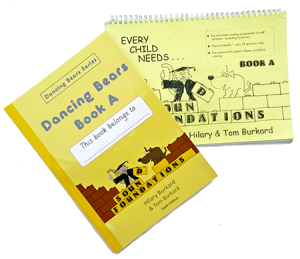 First published in 2001, ‘Dancing Bears’ pioneered synthetic phonics. All the exercises were chosen for their proven success in teaching dyslexic children to read and spell. Six editions later, we are still looking for ways to improve. Our goal is for you to have the best book for your child, which is why our books are constantly evolving. If we can help you with choosing or using our books or if you can help us to improve them we would love to hear from you.